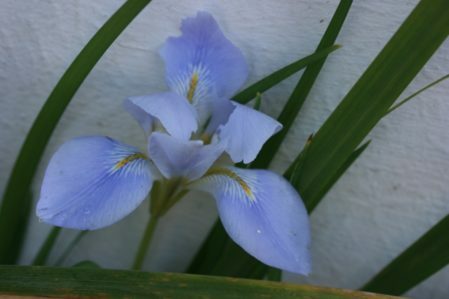 Iris unguicularis has elegant scented lavender flowers with white markings on the haft and a yellow signal. Dec-March. Ht. 30cm. Sp. 30cm. Sun. Well drained soil. Flowers best against a south or west wall. Pick flowers in bud for in the home. RHS Award of Garden Merit. This particular species thrive on a slightly alkaline soil and will benefit from a top dress of lime when planting. Only divide when truly necessary as they can sulk for a few years afterwards and not flower. The Iris flower is held only by a petiole rather than a flower stem so beware of early roaming slugs and mice. syn. Iris stylosa, Iris unguicularis is a native of Algeria and has adapted itself to the harsh climate of that arid land. Resistant to the appalling drought of the North African summer, it flowers during the winter rains. Such a plant is ideally suited to our native East Anglia, thriving in our drought stricken sand. It does however require the protection of a south or west-facing wall, to ensure that it flowers reliably in our less mild winters. It is a trouble free plant, apart from slugs, which sometimes regard their flower buds as an hors d’oeuvre before a main course of Hostas.